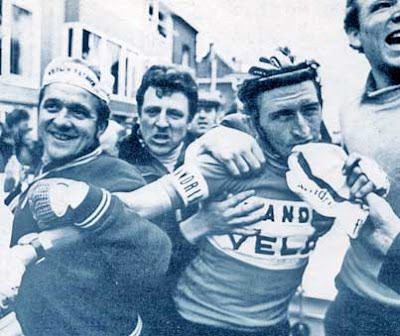 Freddy Maertens is mobbed after he wins his second Gent Wevelgem in 1976! From: Fabulous World of Cycling. A big Flandrian weekend of racing is upcoming with the E3 Prijs Vlaanderen & Gent Wevelgem. A perfect setting is about to begin with plenty of hopefuls in need of a win. And the setting is the weather and cobbles. Forecast is for rain & appropriate cold temperatures for both races. It will be a factor. And more so is the redrawn race of Gent Wevelgem. With 16 leg breaking hill's over 219km. The notorious Kemmelberg climb with it's steep climb dares the riders' before a flat finish in Wevelgem. Both races will produce a worthy 'Flemish' winner before the big cobbled monument of the Ronde, on April 4th!